Robert Mizrachi was all in preflop with A-10, up against his brother Michael's Q-J. The flop was safe for Robert, but a jack on the turn gave the pot to Michael. Robert Mizrachi was eliminated in fifth place, earning $341,429, and setting a record in the process -- the Mizrachis' top-5 finishes set a new record for family members in the same event. 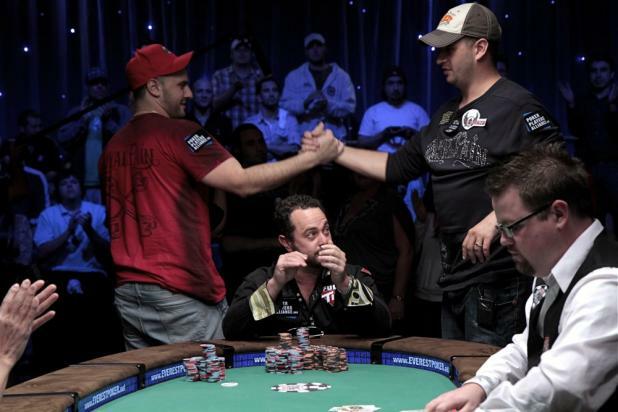 After the dinner break, Robert Mizrachi (right) found himself short-stacked, and he moved all in from the big blind after his brother Michael (left) raised from the button in Hand #87. Michael played the hand the same as if it had been a different player, and called with Q-J. Robert showed A-10, and he was roughly a 60-40 favorite to win the hand and double up. When asked about the hand later, Michael said he wasn't even sure what he was rooting for -- he didn't want to bust his own brother, but he also wanted to win. 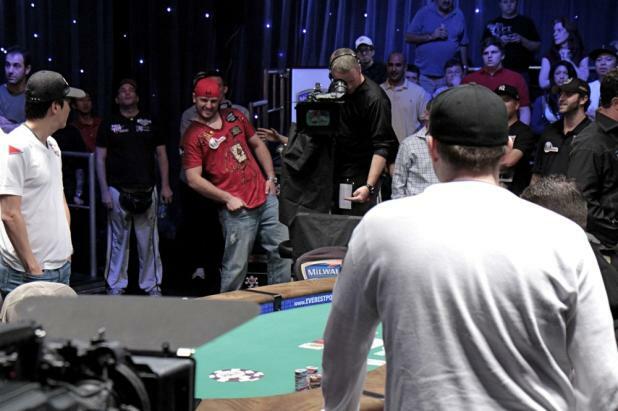 Robert hid his eyes, not wanting to look, and when the flop missed them both, Michael pointed at his brother and told him he was still in the lead. 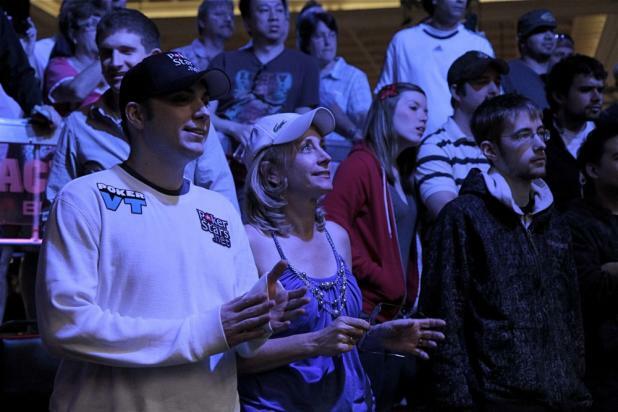 Michael and Robert Mizrachi were being cheered on by their mother (center), and Michael's wife Lily (left). 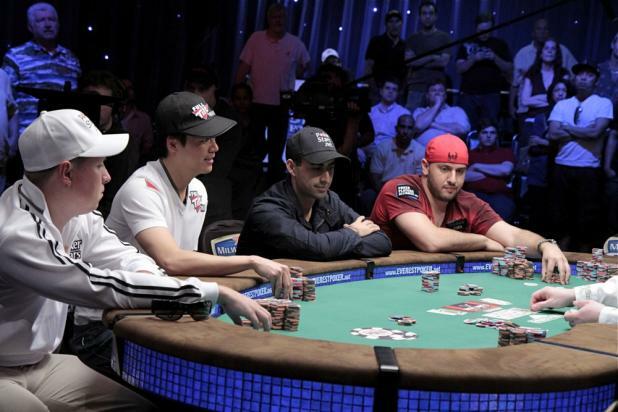 With the two brothers at the final table, they were torn whenever they played a hand together. Lily said that she would rather they didn't play a hand together until they were heads-up for the bracelet, guaranteed to finish first and second. 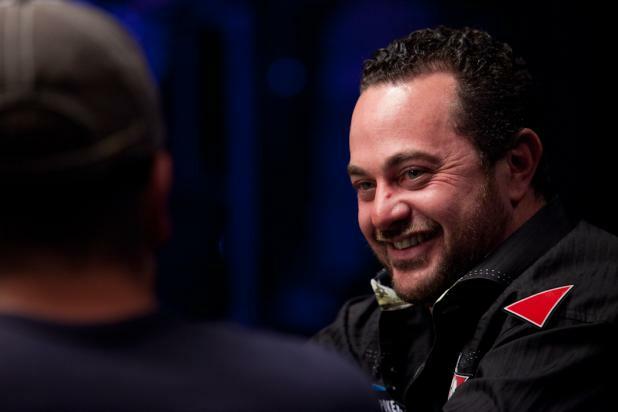 David Oppenheim began the final table of the $50,000 Poker Players Championship with less than a third as many chips as the next lowest stack, and few people gave him much of a chance to win. But Oppenheim picked up some chips early and doubled up to get himself out of the hole, and then made the most of it. 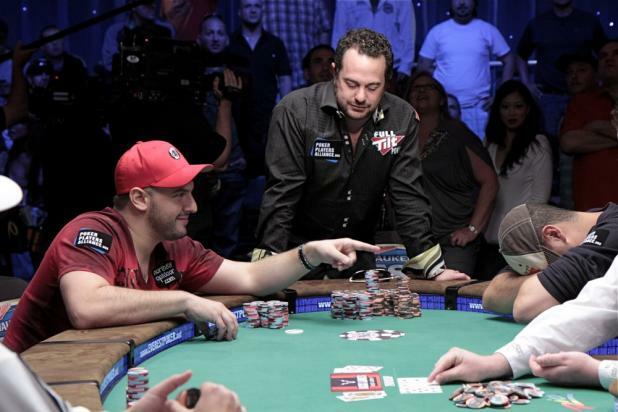 By the time the final five players reached the dinner break, Oppenheim had built a huge chip lead, with more than twice as many chips as anyone else. 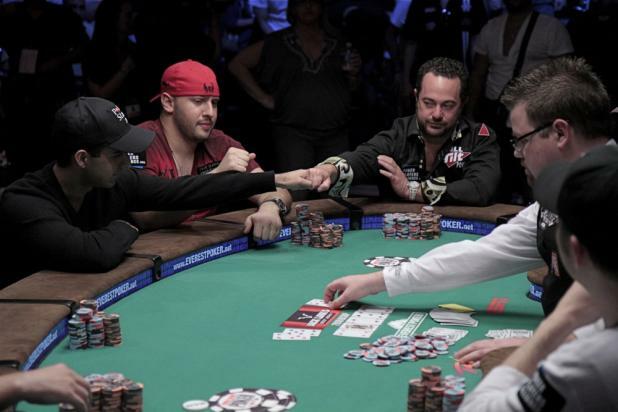 The WSOP's $50,000 Poker Player's Championship is one of the most prestigious tournaments in poker, designed to be a battle of the best of the best. 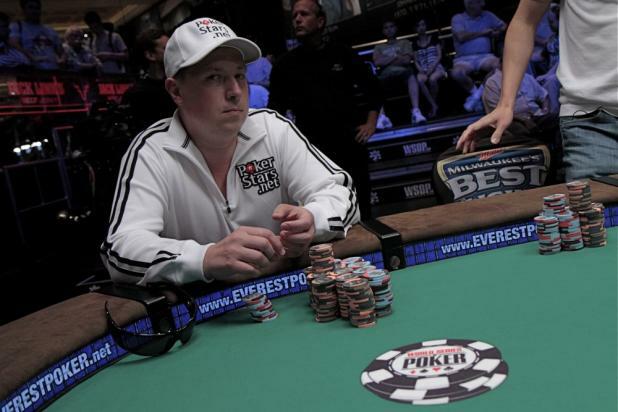 But Vladimir Schmelev, a banker from St. Petersburg, Russia, was the wildcard at the table. He wasn't a professional poker player, but he was giving the pros at the tables fits as he won some big pots and refused to disappear. 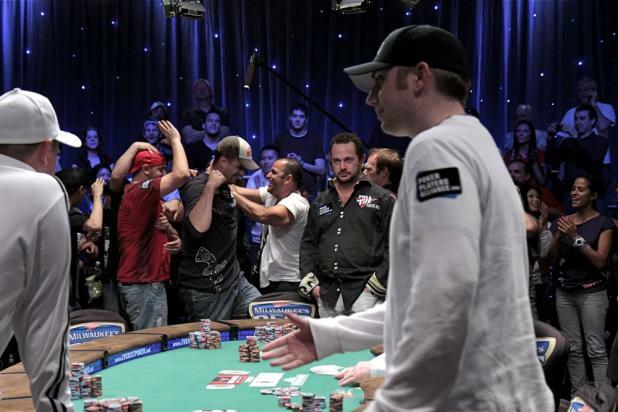 David "Bakes" Baker (right) misses his straight draw on the river, and Michael "The Grinder" Mizrachi (background left, wearing red) is mobbed by his friends and family as he wins the pot with a pair of kings. Baker is eliminated in sixth place (earning $272,275), and extends a handshake of sportsmanship to the remaining five players. David "Bakes" Baker (foreground, right) was all in preflop with A-J against the A-K of Michael "The Grinder" Mizrachi (center, wearing red). Mizrachi flopped a pair of kings, but Baker picked up a gutshot straight draw. The turn card is a blank, and Mizrachi leans in anticipation as he waits for the river card -- any card but a queen will eliminate a very tough opponent. In Hand #63, David "Bakes" Baker moves all in with a short stack, but runs his A-J into Michael "The Grinder" Mizrachi's A-K. Dominated and facing elimination, Baker steps off the stage to stand with his mother (Annella Baker Graham) to watch the flop together. Baker and his mom appear to be much more optimistic than the rest of his friends in the bleachers. With a short stack, Daniel Alaei moves all in with A-6 suited, but runs into Vladimir Schmelev's A-K. The board never offers Alaei much hope of survival, but he still manages to smile as the dealer puts out the turn card. Schmelev wins the hand, and Alaei is out of the tournament in seventh place, earning $221,105. In Hand #58, Daniel Alaei (left) doubles up when his pocket sevens (7-7) hold up against David Oppenheim's pocket sixes (6-6). Alaei was short-stacked, so Oppenheim -- who started the final table as the shortest stack by a good margin -- only took a small hit. The players exchanged a friendly fist bump to show there were no hard feelings.